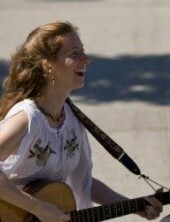 Betina Hershey teaches voice, acting, dance, guitar and piano. Her students have gone onto audition and be accepted into Professional Performing Arts School, Frank Sinatra HS, LaGuardia HS of Performing Arts, performed in movies, TV, sung the national anthem at the US Open, and more. *Congratulations to our many students who will be attending Frank Sinatra H.S. and LaGuardia H.S. as a voice or drama major. *Congratulations to Elisabeth Martin for performing at Carnegie Hall as a 2nd place winner of the 2013 American Protege competition. *Congratulations to Michelle for appearing in a commercial with pop artist Adele during the Grammys, 2012! *Congratulations to Sasha for her beautiful job singing the national anthem at the US Open! ***Guitar, banjo, bass, theory, & jazz lessons are also available through Nick Russo, a full time guitar, mandolin, ukelele, and banjo player. ***Piano lessons are also available through Sunny Knable, our resident Musical Director.